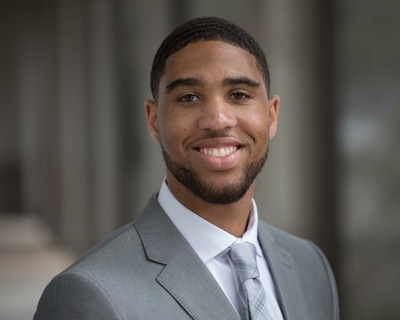 An only child and a smart, well-rounded student growing up in New Orleans, Jacoby Barry developed important life skills that helped him thrive inside and outside the classroom. He excelled academically in math and science, completed AP and honor classes, but also had a passion for playing basketball and was a team captain. When Jacoby was 14 years old, he woke up and found his beloved 47-year-old father lying deceased on the sofa. The night before, his father had shampooed the carpet and prepared dinner; his sudden death was a shock to the family. It sent his mother into a deep depression that required medical assistance and traumatized Jacoby. To make matters even more difficult, his mother discovered her husband had dropped his life insurance policy after not being able to afford it. He had been their family’s main wage earner, and Jacoby’s mom’s depression prevented her from being able to cope with the new challenges. They struggled, argued and soon afterwards, she lost her job and their family home. His mother went to live with a friend, starting a new job in a nearby city to get back on her feet. Jacoby went to live with his aunt. He had to change schools and had a hard time adjusting while still grieving the loss of his father. His grades dipped and he stopped playing basketball. Fortunately, he realized he needed to regroup and dedicated himself to working hard in school so he could reach his full potential. Growing up, Jacoby loved playing video games and all types of technology. In 7th grade, Jacoby joined SeaPerch, an innovative underwater robotics program that teaches kids to build an underwater Remotely Operated Vehicle (ROV), using PVC pipes. His team’s hard work paid off, as they placed first in the regional competition in Louisiana and fourth at nationals in Washington D.C. He competed a second year, which solidified his love of STEM. By his senior year in high school, everything came together. Jacoby graduated with honors and received several academic and leadership awards. He received acceptances from six engineering schools. After much consideration, he choose Mercer University in Macon, Ga. (He first became aware of the school by seeing their basketball team beat Duke in the NCAA tournament.) The university sent him a postcard, and later offered him a scholarship. He visited and lived on campus during his spring break. In addition to studying Computer Engineering, he works as a Student Team Manager for the Mercer Bears Men’s Basketball team to help cover expenses and remain connected to the sport. Jacoby’s aunt found the Scholarship America Dream Award scholarship when she was helping him search for scholarship opportunities and an ad popped up on the screen. He applied right away, a few days before the deadline. Once he earns his Bachelor’s degree, he plans to pursue a Master’s degree. He has seen too many other students get complacent and not get their advanced degree. He learned that to succeed in engineering requires self-motivation and discipline to study beyond class instruction. “As I grow, I will continue to make it my ultimate concern to pay-it-forward in the spirit of giving back, tutoring and doing my Christian duty. I go back and visit my neighborhood to inspire others who have lost a parent and feel hopeless. I urge kids to not give up or be lazy but to work hard to achieve their goals,” Jacoby said.